The most widely distributed snake in North America. Attains a maximum length of about 52 inches. Prefers areas that are close to water, damp woodland and farms. Garter snakes give birth to their young, typically in August or September. Baby garters live on their own after birth, and more than half die before they are a year old. Garter snakes eat a varied diet including frogs, small mammals, earthworms and insects. 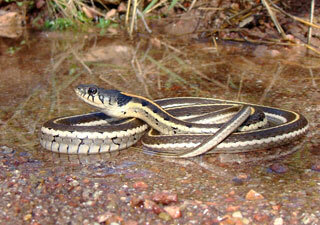 Garter snakes are found throughout Minnesota. During the winter, to keep from freezing, they hibernate below the frost line. They usually find a rock crevice, an ant mound or a tunnel made by a burrowing animal. These winter dens are used by garter snakes year after year.